Danny Rowe was on target again as Fylde maintained their unbeaten start to the season but for once was overshadowed by a fellow scorer. Andy Bond’s screamer from halfway made it 2-0 and put Fylde on their way to a second successive home win. 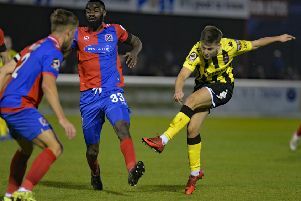 Danny Philliskirk’s efforrt deflected wide after three minutes and a minute later Rowe drilled the ball home form 15 yards after the recalled Joe Cardle’s pass was deflected into his path by Zaine Francis-Angol. Solihull went close on seven minutes, when Carter draggeda shot wide. Bond’s 20-yard effort was saved at the second attempt by Boot. This was a mere sighter for his thunderbolt from 50 yards on 19 minutes. It should have been three on 20 minutes, when Cardle’s lay-off created space for Rowe on the edge of the box. Boot saved his powerful shot and te ball fell to James Hardy but his effort was deflected against a post. Solihull began to get a foothold in the game with a series of half-chances but keeper Jay Roach was not seriously tested until he got down to save a low drive by Yussuf 10 minutes before the break. Lynch saved Osborne’s effort from outside the box but the final chance of the half fell to Fylde as Rowe accepted Ryan Croasdale’s pass and curled a 30-yard effort inches wide. The game was brought to life two minutes after the restart, when a Solihull corner was flicked home by Maxwell from close range to halve the deficit. The scorer had another chance, looping a header over the top, but Fylde regrouped as Cardle volleyed over and then saw an effort deflected wide. Hardy went closer but his shot was cleared off the line. Cardle made way for new Coasters cult hero Gime Toure, who wrapped up the points within a minute of coming on. Francis-Angol exchanged passes with Hardy but saw his shot saved and Toure converted the rebound on 67 minutes. Moors thought they were back in the game again on 70 minutes but the goal was disallowed. They went close again on 76 minutes, when Reckord’s effort rebounded off a post into the grateful arms of Lynch. There were further late chances for both teams as visiting keeper Boot denied both Toure and substitute Serhat Tasdemir, while at the other end Yussuf beat two defenders but shot wide when it looked easier to score.